Yesterday I’ve blogged about Accelerators Platform and now I’m looking at a website googletranslateclient.com which offers to download a standalone VB6 win32 application that uses google translate service to dynamically translate a selected text. Funny thing is that this program implements what Accelerator Platform is invented for, but in a very limited and counter-productive way – its functionality is limited to only one service so nobody can enhance it! I think the best thing Microsoft could do would be to create a program that would capture text select event in any window and add Accelerators group to the context menu of that program! Or alternatively, if this is too much work, just show Accelerators icon ( ) when any text is selected. I’m not much of a system application developer, so I’m not sure this is easy to do, but I’m sure people would benefit from it and developers wouldn’t need to add Accelerators API support in their apps! Hope that someone will pick this idea. I just love the way programs are organised on new Windows 7 taskbar. if you have, say, ten commonly used programs and put them on a quicklaunch and then open all them up, you’ve suddenly got quicklaunch icons just taking space and doing nothing as the programs are already opened. And you’ve got your programs’ icons in the taskbar – so you effectively have two icons for every program – one for launching a program and one for controlling its window state. In windows 7 the new approach is taken. Basically, taskbar and quick launch are combined in one place and then enhanced a lot. The concept is just great – you don’t need to check if a program is running or not to get it shown – you just click on its icon and if its running, you’ll get its window, otherwise it will launch and you will still get its window. Less cognitive effort, better usability. One of the implications of this approach is that the space on the taskbar is saved by having “program-launching” and “window-managing” controls combined. As you can see, Far, Explorer and Microsoft Word are not launched, Outlook, Messenger, Sticky Notes, Live Writer and IE8 are running. So managing multiple program instances is really easy – when you hover on an item, its window appears on the screen so you can preview if this window is what you were looking for and click on it to open. You can also close any window from the group right from the taskbar. Again, when you hover on an item, its window is shown, so you either click on it to make it active or close it down. 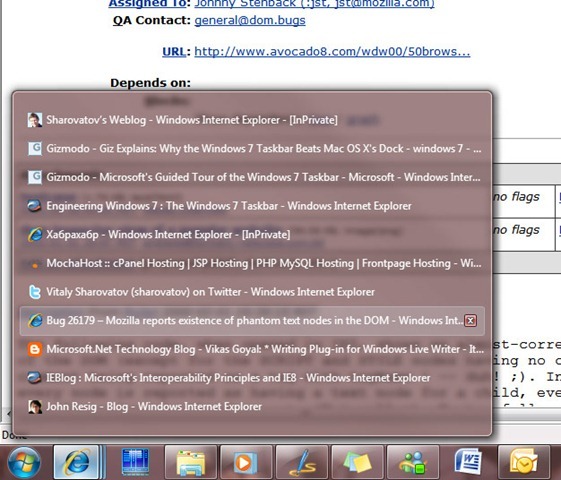 And all the features I showed is just a part of all the goodness Windows 7 taskbar introduces. 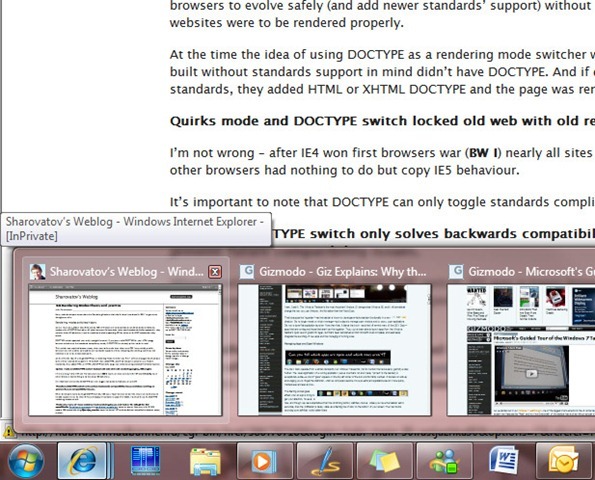 So yes, I agree with Gizmodo that Windows 7 Taskbar is much better than MAC OS X dock.